Placerville, California is apple country. This time of year, apple farms line nearby country roads and all manner of apple products are sold - apple pies, dumplings, fritter, ciders, doughnuts, sauces, cookies, and of course...caramel apples. On our drive from San Francisco to Lake Tahoe last weekend Wayne, Jennifer, and I pulled over in Placerville to have a picnic lunch at one of the local wineries nestled in the Sierra foothills. On our round-about way back to the highway we also visited a couple of the local apple-centric attractions. It was just the reminder I needed. 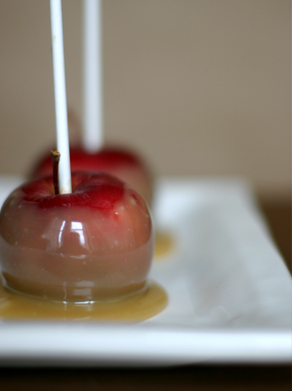 For years I've wanted to do a new caramel apple recipe for my site. I thought I might be able to do a version using apples, honey, cream, and salt. That's it. No white sugar, no corn syrup, and no melting of Kraft caramel squares. 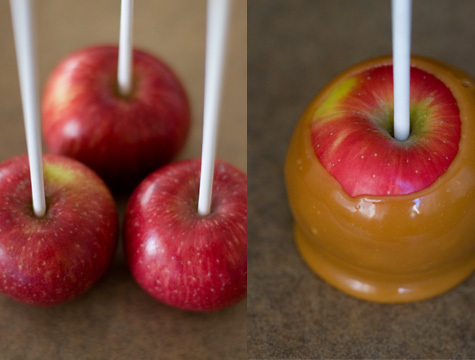 I also wanted to avoid a few of the caramel apple pitfalls that have tripped me up in the past. For example, I needed the caramel to stay on the apple. Lots of people, myself included, have had trouble with caramel not setting on their apples. I decided to use the technique I use to make my favorite caramels - the honey-sweetened caramel gives the apples a beautiful, opaque, golden coat and tastes rich, chewy, and decadent. A few things you should know before you start. You need a candy thermometer. I have one from Whole Foods Market that cost me about $4 - works fine. But I'm going to admit, this time around I used my infrared thermometer gun. Either way, a thermometer is important because the key to this caramel recipe is achieving a good set, you want your caramel to be able to hold a shape once it cools. To make this happen you need to heat the ingredients to a very specific temperature. I know it all sounds precise and fussy, and to a certain extent it is, but really all you're doing here is putting a very short list of ingredients together in a pot, and bringing the temperature up, up, up into what is considered "hard ball" territory 255F - 260F degrees. If you don't heat the caramel enough, it will likely run off the apple, but alternately if you go too hot the caramel will be difficult to bite into, and will have more of a tendency to peel off the apple. 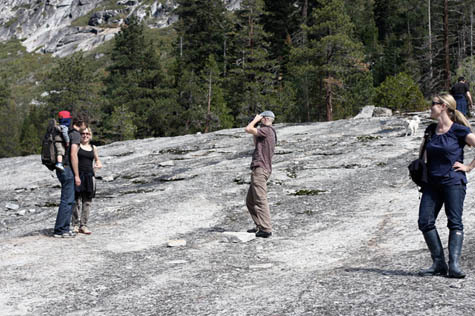 The shot up above was taken by Jennifer Jeffrey on our Sunday morning, Sierra Mtn. stroll. Please be careful when making caramel apples, you will be working with dangerously hot, sticky, ingredients - I always put on an apron and make sure I have a closed-toed pair of shoes on when making candy. Be extra, extra careful if you have kids around. On the ingredient front, I typically go for a mild clover honey when making caramels. Push a lollipop or popsicle stick deep into each apple - in through the stem. Fill a large bowl 1/2 full with ice water and set aside. In a medium, thick-bottomed saucepan heat the cream and salt until tiny bubbles start forming where the milk touches the pan - just before a simmer. Stir in the honey. Bring the mixture to a boil. Now reduce the heat to an active simmer and cook, stirring constantly with a wooden spoon, for about 15-20 minutes minutes or until the mixture reaches about 255-260F degrees. To stop the caramel from cooking, very, very carefully set the bottom of the saucepan in the bowl of cold water you prepared earlier - taking special care not to get any of the water in the caramel mixture. Stir until caramel begins to thicken up - you want the caramel to be thin enough that it will easily coat your apples, but not so thin that it will run right off. If the caramel thickens too much simply put the pot back over the burner for 10 seconds or so to heat it up a bit. I tilt my sauce pan so all the caramel forms a pool on one side, and use my other hand to dunk and twirl each apple until it is thoroughly coated with caramel. Place each apple on the parchment lined baking sheets and allow the caramel to cool and set. Makes 6 - 8 caramel apples.